Once upon a time, well it was actually about 40 years ago, we had this great idea: sell folks a big bunch of wood, parts and instructions to make their own guitar. We thought the idea was so great, we made 30 kits. Only 3 of them ever sold and we only know of one person that ever made their Kit (it was a bass). Ever since then, we've been moving that pile of wood around from shop to shop. Some of the bodies were used for fixtures and prototypes, and for a while, we forgot about those old kit guitars. 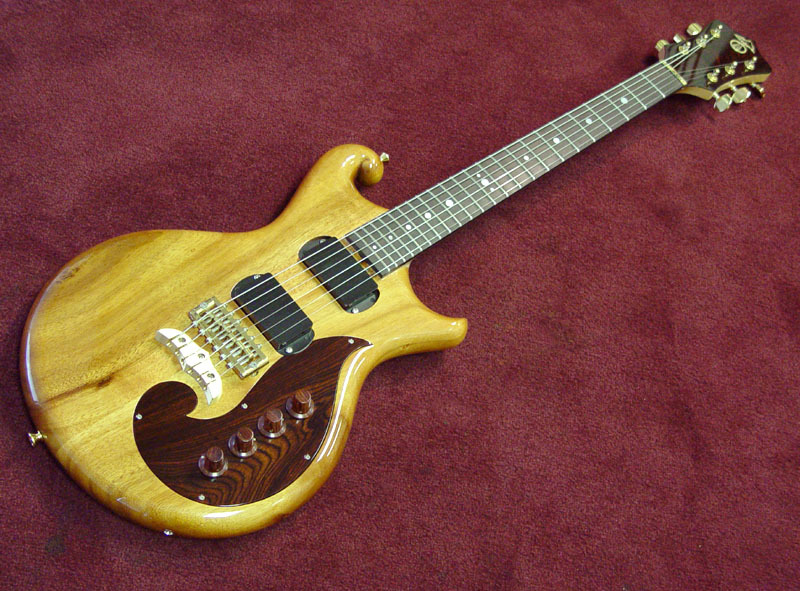 Last year, we found 9 of these Koa bodies in a dusty corner and decided to finish building the kits ourselves. Now, we can't resist making things a little special when we get the chance, so there's lots of neat stuff on here. The original kits were supplied with a brass front plate for mounting the electronics. That was pretty cool, but even cooler is wood - so on this one, we made a solid 1/4" thick plate of Coco Bolo for the front. Note how the edge "kisses" the edge of the pickup. 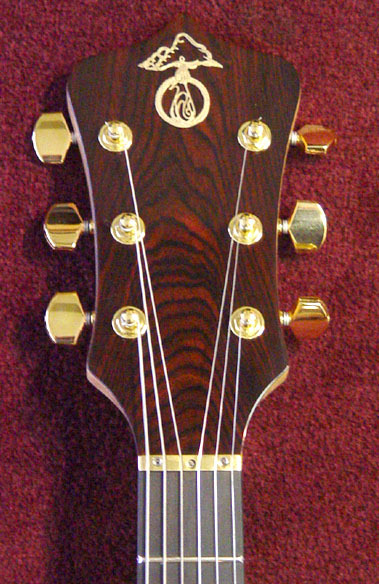 The front of the peghead is a matching veneer of Coco Bolo. Sweet. 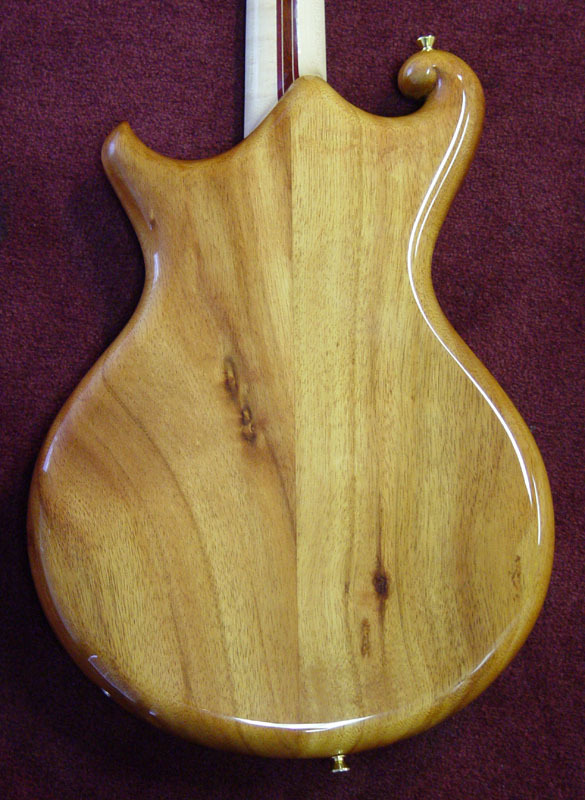 Solid Koa for the body is reinforced with a spline of Koa down the center. 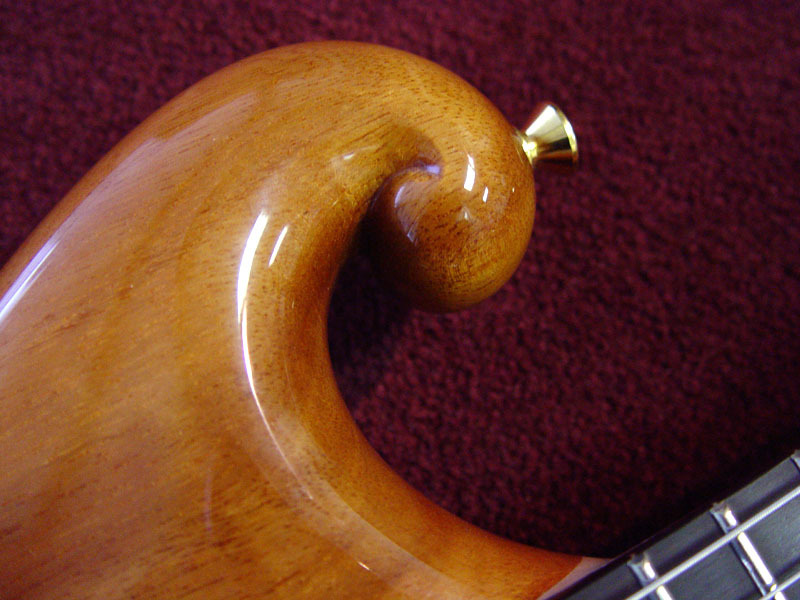 We've carved a wonderful curled upper horn, please do check the closeup picture below. 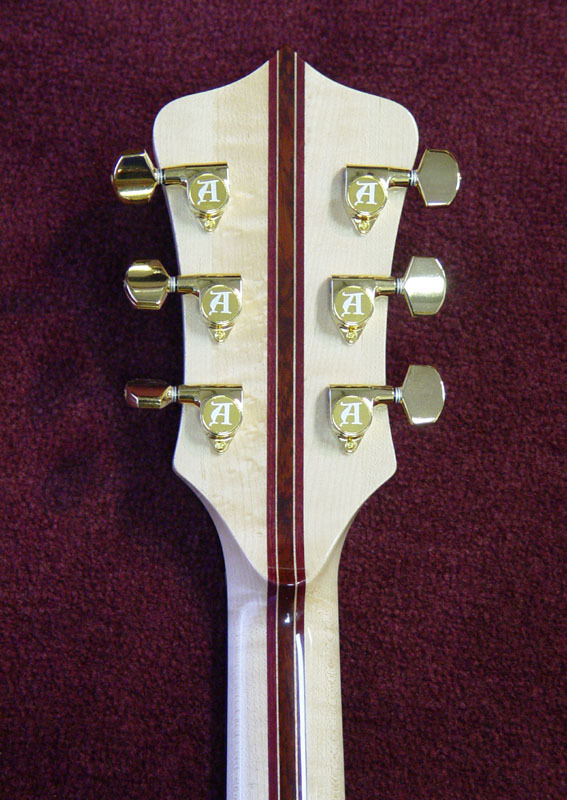 We selected the unique combination of woods for the neck. Maple for the outside laminates, with a center strip of Vermilion framed with Maple veneers and small laminates of Purpleheart. The Kit guitar has a solid warm sound, with clear highs that are never brittle. Simple electronics - just two volumes and two filters make finding your perfect sound that much easier. We asked Roger at THG knobs to make the Coco Bolo knobs with small golden mother of pearl indicator dots to complete the look. The other 8 Kit guitars will be completed in the future - each with a different accent wood and feature set.